The 2017 legislative session is well underway and the OSEIA legislative team is hard at work. We are pursuing the policy agenda developed by the membership and approved by the board. Here’s an update on what’s happening with the key bills taking up most of our time. HB 2681 – Six-Year Extension of the Residential Energy Tax Credit (RETC): This bill had its first hearing on March 29. We had great representation from all over the state from both the solar and energy efficiency industry, clean energy advocates and rural economic development staffers. Shannon Souza of Sol-Coast in Coos Bay and Shaun Franks of True South Solar in Ashland did a great job talking about the RETC’s impact in their communities and on their businesses. Great job, Shannon and Shaun! We are expecting to move the bill soon from the policy committee to the Joint Tax Credits Committee where we will have to work hard to make the case for the tax credit. HB 2760 – Property Tax Exemption for On-site Renewables: The bill moved from the House Energy and Environment Committee to the House Revenue Committee on April 4. There is no opposition to the extension of the property tax exemption and the price tag is not that big. We will be looking for the bill to be scheduled in the next several weeks. HB 3227 – Create a Tax Incentive for Community Solar Participants: The legislature created a community solar policy in 2016 that will give people who cannot put solar on their roofs the opportunity to participate in a solar project and see the benefits on their utility bill, just as if there were solar panels on their roof. Although people who cannot put solar on their roof are unable to access the RETC, they should be able to get some sort of taxpayer assistance to participate in a community solar project. While many agree with that policy approach, the money to support the policy will likely be hard to come by in the current state budget. But we are making the case and we’ll see what happens. This may be a multi-session effort. SB 339 – Clarifying the Small-Scale Renewable Mandate in the Increased Renewable Energy Standard: When the legislature increased the Renewable Energy Standard for Oregon’s two largest private utilities, they included a mandate to include a portion of small-scale renewables (under 20 MW). The small-scale renewable mandate was not clear about some details and this bill is intended to clarify those details. The bill is being led by the Community Renewable Energy Association (CREA) and OSEIA is one of the groups working to help the bill along. SB 979 – Renewable Energy Direct Access: Many large utility customers (Wal-mart, Microsoft, Facebook and the like) want to have access to increased renewable resources to be able to say that they are powered by renewable energy. An attempt to create the ability for utilities to provide those resources under a special tariff fell about a year ago. This bill proposes a process that allows these large customers to leave their utility and access renewable resources from an energy service supplier. The bill is led by the Northwest-Intermountain Independent Power Producers (NIPPC) with OSEIA in a supportive role. Key Deadlines Approaching: The session is about to hit key legislative deadlines for bills to get moved out of their originating committees. Most of the bills we are working on should meet those deadlines but it will be good to have the field cleared a bit of other bills that aren’t going anywhere. Sign up for Solar Lobby Day: If you are interested in helping to support important solar legislation, you should attend Solar Lobby Day on Monday, April 17. Starting at 9am at the Capitol in Salem with legislative appointments happening between 10am and 3pm. We’ll be all done by 4pm. The day will be chock-full of briefings and discussions with legislators. Even if you’ve never lobbied before, you’ll have all you need to be effective. 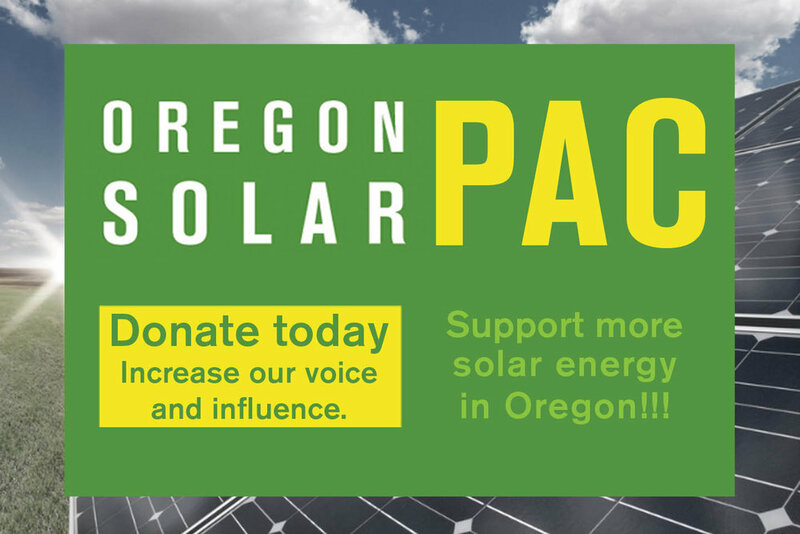 Sign up to be part of Oregon’s Solar Army and come to Solar Lobby Day! It’ll be fun! Stay tuned! Things are just heating up!